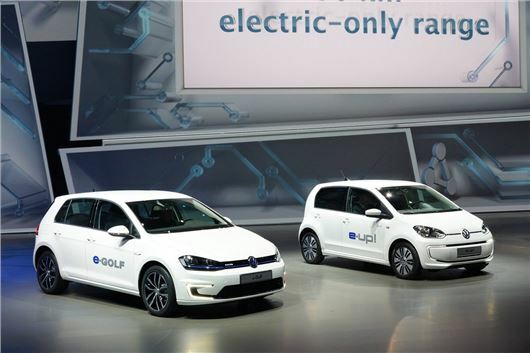 Volkswagen has unveiled two electric cars at the Frankfurt Motor Show - the e-Up and the e-Golf. Both electric models look identical to their conventionally powered equivalents but are powered by electric motors using lithium-ion batteries. The e-Up is powered by an 82PS electric motor with 210Nm of torque and can accelerate from 0-62mph in 12.4 seconds. As that torque is available from zero revs, it will be ideal for nipping away from a standstill in busy city traffic. Thanks to lithium-ion batteries - that have been developed in-house by Volkswagen - it can travel up to 100 miles on a single charge. And using a fast charging station, the battery can be charged back to 80 per cent in around 30 minutes. As you'd expect, the Golf has a longer range of 120 miles and has a more powerful motor with 115PS and an impressive 270Nm of torque. That means a 0-62mph time of 10.4 seconds. Like the Up it has two driving modes, Eco and Eco+, plus four activate regenerative braking modes designed to help extend the maximum range. Standard features include automatic climate control, satellite navigation, a heated windscreen, LED daytime running lights in the e-Golf, Volkswagen's first use of LED headlights, a feature that's already available on the new SEAT Leon.